Becauseweliveit are dropping their debut release. And they're doin' it the right way. A classic black 180 gr 33,3 rpm 12" maxi-single including 3 versions plus the respective instrumentals of the smasher track “To The Fullest”. 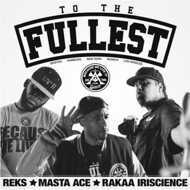 On 12 Finger Dan's original version they got REKS, Masta Ace, and Rakaa Iriscience [of Dilated Peoples] droppin' powerful verses – that's Hamburg, Boston, New York, and Los Angeles united for the cause of that boom-bappin' true Hip Hop. For the cuts Stevie Drumz from Munich joined 12 Finger Dan of Soulbrotha, and they went crazy. The spherical Dilla-esc Rekless remix does not only feature an extra Roger Rekless verse and him plus his companion Boshi San singin' the hook. But also some extra keys by Ningu Strom of Tribes of Jizu, and scratches by Al Rock who is one of Roger's 4zu1 crew members.